Sit back, relax and let me do the work for you! I am passionate about travel and it shows through my customized vacation planning and dedication to stellar customer service. I have worked in the travel industry since 2001 as a flight attendant and as a travel consultant and I am passionate about travel! I now run my own travel business, Burkhart Vacations, supported by Travel Professionals International and more then 850 Advisors across Canada. I specialize in all-inclusive vacations, cruises, Disney vacations and cruises, group vacations as well as destination weddings. Allow me to customize a vacation for you so that you can start making memories! Contact me with your vacation requests. I look forward to planning with you! A 7 night Mediterranean Cruise aboard the Disney Magic. Ports of call: Barcelona, Spain; Naples, Italy; Rome, Italy; Florence/Pisa, Italy; Cannes (Monte Carlo, Nice), France. 4 adults and 5 kids ranging from age 6-11. Ask me how I booked private tours of all of the sights in order to keep all 5 kids (and the adults!) 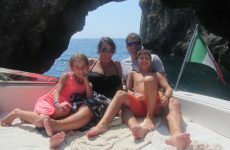 happy...including a private yacht tour of the Amalfi coast! Burkhart Vacations is an independent owner, affiliated with TPI.